Silk has rather passed my wardrobe by, apart from a drawer stuffed full of ties by the likes of Harvie & Hudson, Hermes, and Paul Smith, which largely remains untroubled these days. I’ve always associated this by-product of the Mulberry Silkworm larvae with women’s underwear, and that variety of flouncy shirt worn by blow-dried men with suede loafers and a love of musical theatre. Perception of silk is changing though. 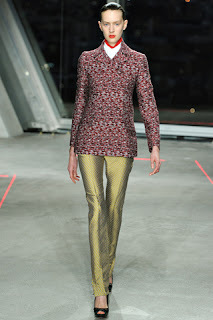 Influential though it was, wipe the image of those foulard prints from D&G’s final, influential offering from your minds, Haider Ackermann’s opulent jewel tones (pictured above), or the shimmering woven silks from Jonathan Saunders’ Autumn/Winter collection, which so richly evoke Britain’s modern multicultural society (pictured below). 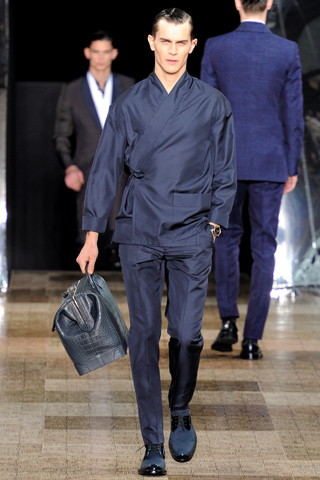 Silk has been given a grown-up 21st Century reboot, and this is more than evident in menswear. 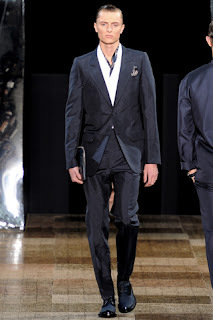 Ermenigildo Zegna is first off the blocks with Zegna Silk, a selection of super-sharp suiting and outerwear in a sober, matt palette which is light years away from the fibre’s traditional associations of ladylike lustre. 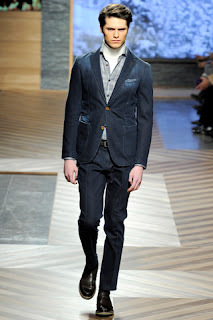 Zegna have mixed silk yarn produced by a mill acquired two years ago with cashmere, linen, and even cotton to emulate the waxed cotton used in jackets, albeit breathable and considerably lighter. The result is an eye-wateringly expensive capsule wardrobe for the global business leader. This target demographic continues to be the focus of Kim Jones’ menswear collections for Louis Vuitton. Jones’ second collection for the luxury French luggage house, inspired by Seventies fashion illustrator Antonio Lopez, is extravagant in the extreme with its use of Astrakhan, crocodile, kangaroo fur, and soft calf suede, but it’s the British designer’s use of silk which raises eyebrows further. Hand-spun at a rate of twenty centimetres per day at a UNESCO World Heritage site, the fabric used for Vuitton’s tuxedos is perhaps the ultimate antithesis to “Fast Fashion”, and commands a typically exorbitant price tag. These two companies are obviously courting the Far East market, and Jones underlines this further by including kimono jackets and Chinese zodiac details, but could silk menswear, more durable than linen and lightest than the finest gauge wool, become the norm during warmer months? Well, certainly not at these prices but, as with everything, the concept will be dumbed-down and streamlined for high-volume retailers. Just look at what masquerades as Pashmina these days. As it stands silk remains the preserve of the one per-cent, those with a concierge willing to take those regular trips to dry-cleaners. Article written by Lee Clatworthy (@TeamChutzpah) for Katie Chutpah blog.